ArtiMinds RPS combines online and offline programming in a unique, intuitive package to easily create complex robot programs without writing a single line of code. 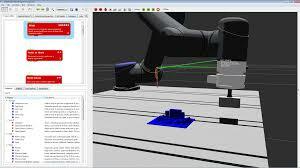 Description Make your robot even more powerful with our software and benefit from the award-winning ArtiMinds RPS. Get to know the highly innovative RPS which enables fast and intuitive programming of complex robot tasks, including sensor-adaptive motions. The software may be used by integrators when building a solution as well as by end-users for easy and fast post-installation adaptation.